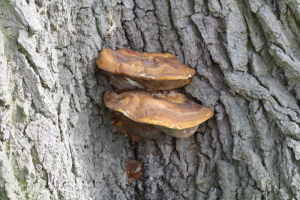 Observation - Bracket fungus on veteran Oak tree - UK and Ireland. Description: Large Bracket fungus on lower trunk of veteran English Oak Takeley Hill, Hatfield Forest. Large Bracket fungus on lower trunk of veteran English Oak Takeley Hill, Hatfield Forest.